The Petrostate Republic | This is Ashok. Edit: Brad Plumer has a piece making the same argument. It’s wrong for the same reasons. Also, I’ve heard an AD argument suggesting that an increase in oil-exports will cause inflation. This is wrong for the same reason every nut who claimed America’s deficits, or lack of austerity, will cause inflation. In fact, a little more inflation would probably be a good thing. No matter, as I note, the supply-side benefits of cheap oil probably outpace the effects of demand. Another Edit: Altman and Plumer are right that resulting investment will cause an appreciation of the dollar, even in the counterfactual that the increased exports came from, say, Oman. This is because the infrastructure behind oil production need Omani labor, Omani land, and hence the Omani rial. The cost from demand of oil itself, though, is no different whether it’s flowing from Oman or the USA. To buy all that oil and gas, America’s new customers will need dollars — and that will begin to push up the currency’s value. It will rise further still if the oil and gas industries energize the U.S. economy enough to pull in new investment from abroad. Though these shifts will be dramatic enough, the most profound effects will be on American workers and consumers. A stronger dollar is usually fine for Americans, as long as their purchasing power keeps up with the currency. Yet this is exactly where the problem will be. The new exchange rates will make it harder for non-petroleum industries — where many more Americans are employed — to export their products. At the same time, the strong dollar will make imports more affordable to American consumers. Some of the money generated by oil and gas will still filter through to other industries, but those dependent on exports or competing with imports could find themselves in a dire situation. The news for consumers is not all good, either. With more income coming into the country, local prices will creep up as well. The United States might go the way of Norway and Australia, rich countries that have become two of the world’s most expensive places to visit and live, in large part because of their resource booms. The combination of higher prices for goods and services and falling wages in industries unable to compete at the new exchange rates will squeeze household budgets from both ends. I share the same concern increasing prices will have on the median consumer, but think this argument is ultimately unfair. First of all, when it comes to oil, Altman seems to argue that there’s something particularly special about American oil exports. To the contrary, because oil is priced in dollars, American consumers are vulnerable to increased exports of oil whether the crude originates in Saudi Arabia or Texas. For this reason, the comparison to Australia is incorrect, because the rapid rise in Australia’s exports weren’t on the dollar standard. The increase in oil production is exogenous (recent technological advances clearly support this theory). This rather simple graph illustrates why increased American exports won’t necessarily drive an increase in dollar value. R1 + R2 represents the initial demand for dollars, while R2 + R3 represents the demand for dollars after a positive supply shock. It’s clear that, due to price inelasticity, the demand for the dollar has fallen. A retrospective edit: I should note that I know the price of oil will continue to increase, certainly from rising demand but possibly also from supply-side factors like peak oil phenomenon. Under price-inelastic conditions, this would imply an increased demand for the dollar. However, this graph demonstrates the supply shock against the counterfactual in which America doesn’t export oil which, I think, vindicates my argument. Oil isn’t like corn or steel. We run the oil market, and hence any exogenous increase in exports, whether from Saudi Arabia, Qatar, which means demand for dollars will increase, regardless. Again, the undertone of the article suggests that Altman feels it’s worse that the oil is coming from the US as opposed to the Arab-world, but the fact is that if dollars are going somewhere, they might as well go home. It also seems odd to suggest that we might become the “United Petrostates of America”. Even as a nation that championed the idea of free, international trade in the 20th Century, imports and exports remain a relatively small portion of the American economy. “Petrostate” connotes the Saudi disaster that is an economy so drunk and dependent on state capitalism of oil that all institutions become extractive, failing to make the leap of human development required of a modern nation. There’s another problem with Altman’s argument. Exports will increase, driving demand for the dollar, which will make imports cheap, increasing our deficit. But this is how trade works! If there’s one concept we all remember from Econ 101, it’s that trade is ultimately self-correcting. Now, one may argue that frictions and controls across money markets won’t let this happen, but Altman – too – in his argument assumes a pretty mainstream interpretation of international trade, so I see no problem criticizing his conclusion on these premises. We share a similar concern about the income derived from increased production. 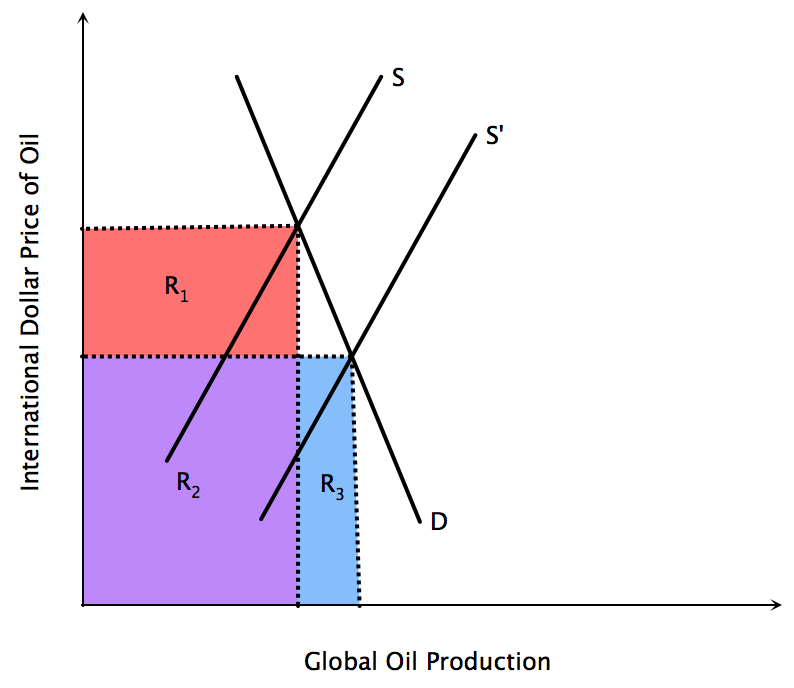 Unlike Altman, I do think the supply-side effect of oil will far exceed its impact on aggregate demand, resulting in cheaper energy and higher real incomes for all. The US should learn from Norway how to direct an oil boom to the well-being of all without concentrating all the benefits in a rent-seeking minority. I don’t know whether the answer to this lies in high taxes; regardless, income from land should ultimately be shared by every American. Oil is a dirty good. We didn’t build our country on oil, but on ideas. It will be damning if this windfall impedes our efforts to move to cleaner sources of energy and, as Altman fears, crowds-out better investments. In the end, if we can divorce ourself from the mess that is the Middle East, we will achieve a geopolitical landmark, allowing us to pursue policy that is truly for greater, visionary interests rather than the short-term need for oil. Arab dictators will no longer have an iron grip on international development and, perhaps, citizens thereof will be freed of the real resource curse. In the mean time, we should ensure that the coming windfall in investments derived from energy will be directed towards clean energy, human capital, and greater equity. This is no different from any other export, and the relative cost to the US, unlike other exports, is nil because oil is, by standard, denominated in the dollar.